Jacob Zamora was a 19-year-old young man with a dream of becoming a California Highway Patrol officer. Unfortunately, Jacob didn’t live long enough to realize his dream. But his name and his dream live on in the annual Jacob Anthony Zamora Sporting Clays Memorial Shoot. This event is not a day of mourning, but a celebration of Jacob’s life. Held November 19 at the beautiful Oaktree Gun Club in Newhall, California, this year’s event drew shooters from all over the southwest, including some of Jacob’s close family and friends. With all proceeds raised to benefit the Newhall chapter of the California Highway Patrol Explorer Program, it’s easy to see why this event is so popular. 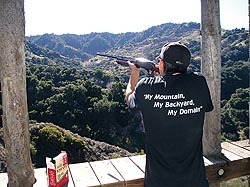 Oaktree’s sporting clays course is laid out over the rugged terrain of the Santa Monica Mountains located just north of Los Angeles. With deep canyons and tall mountains to work with, owner Tim Mitchell and manager Tom Stephens set a challenging course. Even though this was a charity event, they used everything at their disposal to confound shooters. Take a tour of some of the nation’s must-attend tournaments. For family fun, add to your calendar a few that offer much more than shotgunning. Filled to the gills with “how-to” and “howmanydidjaget,” it’s the “how” I want to mend on this trip. What can a true sporting clays shotgun do for your game? Now’s the time to find out—well before the next sporting season gets underway. Each bird’s flight has a beginning and an end. If you’re only paying attention to what that clay is doing in-between, you’re missing out—and probably missing big time. This sporting clays shoot honored the memory of a sporting friend.